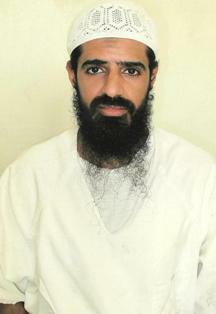 Walid Muhammad Salih bin Mubarak bin Attash (Arabic: وليد محمد صالح بن مبارك بن عتش‎; born 1978) is a Yemeni prisoner held in extrajudicial detention at the United States' Guantanamo Bay detention camps. The Office of the Director of National Intelligence described him as a "scion of a terrorist family". American prosecutors at the Guantanamo military commissions allege that he helped in the preparation of the 1998 East Africa Embassy bombings and the USS Cole bombing and acted as a bodyguard to Osama bin Laden, gaining himself the reputation of an "errand boy". He is formally charged with selecting and helping to train several of the hijackers of the September 11 attacks. Attash was given victim status in Poland for his alleged torture by Americans in a CIA black site on Polish soil. Hailing from a prominent Saudi family on friendly terms with Osama bin Laden, Attash had several brothers fighting during the tumultuous 1990s in Afghanistan. His family was deported from Yemen based on his father's radical views, and he grew up in Saudi Arabia. He studied at the University of Islamic Studies in Karachi, Pakistan. Attash lost his right leg in 1997 while fighting against the Northern Alliance and wore a metal prothesis in its place, leading to the nickname "Father of the Leg". His brother was killed in the same battle, and his death led Attash to join al-Qaeda. He was asked to help obtain explosives to target the USS The Sullivans in 1999, as part of the intended 2000 millennium attack plots. In late 1999, while using the nom de guerre Khallad, Attash phoned Khalid al-Mihdhar, informing him of the upcoming Kuala Lumpur al-Qaeda Summit. In January 2000, Attash flew to Malaysia, ostensibly to receive a new prosthetic leg, and attended the summit. On January 8, Malaysian Special Branch informed the CIA that Attash had flown to Bangkok together with al-Mihdhar and Nawaf al-Hazmi. While there, the FBI received a transcript of a phone call from Fahd al-Quso and one of the USS Cole bombers, which mentioned giving Attash $5,000 to purchase a new prosthesis. During later interrogation, al-Quso confessed that he was handing over $36,000, and that it wasn't actually meant to purchase a prosthesis. In October 2000, Attash was identified as the mastermind behind the USS Cole bombing which took place in Aden, Yemen. On September 11, 2002, his 17-year-old brother Hassan bin Attash was taken prisoner by Pakistani forces raiding the Tariq Road House, handed over to the Americans and sent to The Dark Prison. Attash was captured together with Ali Abdul Aziz Ali in Karachi, on April 29, 2003. He was sent to The Dark Prison, and his brother was moved to Guantanamo Bay detention camps in 2003 or 2004. While there, he was interrogated under harsh circumstances and confessed that Abderraouf Jdey had been known to him. Despite having only one leg, he was forced to stand in stress positions, "an acutely difficult technique for him" as the Americans took away his false leg, forcing him to balance awkwardly on one foot until losing his balance and ripping at the tendons in his arms. He was transferred to Guantanamo on September 6, 2006, together with 13 other "high-level detainees" the CIA had been holding in secret detention. Having been brought to Guantanamo from black sites, the new prisoners were accorded a new series of Combatant Status Review Tribunals, to determine whether the captives met the new definition of an "enemy combatant". They had been instituted in 2004 to mitigate the Supreme Court's findings that the holding of prisoners at Guantanamo Bay was unconstitutional. Combatant Status Review Tribunals were held in a 3×5 trailer where the captive sat with his hands and feet shackled to a bolt in the floor. Unlike the 2004 CSR Tribunals the Press was not allowed to attend the 2007 Tribunals. A Summary of Evidence memo was prepared for the tribunal, listing the alleged facts that led to his detainment. These included that Mohammad Rashed Daoud al-Owhali had stated that Attash had told him to prepare for a suicide carbombing against East African embassies of the United States a month or two before the attacks occurred. The memo alleged that Attash had trained in close-combat in the Lowgar training camp and seen Osama bin Laden give a speech to graduates of the camp. The memo also alleged that Attash used a Yemeni merchant's registration card that had been forged by "a suspect of the USS Cole bombing". An unnamed participant in the Cole bombing also confessed to being given a letter written by Attash which asked for his assistance with the bombing, and was the only reason he aided the bombers. It also said that authorities knew of an al-Qaeda cell dubbed "Father of the Leg" that revolved around a senior member, and believed this was a reference to Attash due to his missing limb. It also stated that a contact stored in the phone belonging to Attash was also listed as a contact in a notebook belonging to "a senior al Qaida operative", and that his University ID card had been found "at an alleged al Qaida residence" in Karachi. He was also "implicated" by a notebook found during a raid, which listed payments made to various al-Qaeda members. An unnamed source also claimed to have seen him at al Farouq training camp. Bin Attash attended his Tribunal. A week after the March 12, 2007, tribunal, Attash was reported to have confessed to his role in preparing both the Cole and Embassy attacks. He confessed purchasing the explosives and small boat used in the Cole bombing, as well as recruiting the perpetrators, and planning the operation 18 months before the actual attack; he stated that he was in Kandahar, Afghanistan with bin Laden at the time of the Cole attack, and in Karachi at the time of the simultaneous embassy bombings meeting with the mastermind of the attack. The DoD was later to publish a ten-page transcript from the unclassified portion of the Tribunal. I was the link between Usama bin Laden and his deputy Sheikh Abu Hafs al-Masri and the cell chief in Nairobi. I was the link that was available in Pakistan. I used to supply the cell with whatever documents they need from fake stamps to visas, whatever. His Personal Representative met with him on February 13, and told the tribunal that Attash confirmed that many of the allegations were basically correct, but that he had never owned a telephone and that he had forged the Yemeni registration card himself. The Department of Defense announced on August 9, 2007 that all fourteen of the "high-value detainees" who had been transferred to Guantanamo from the CIA's black sites, had been officially classified as "enemy combatants". Although judges Peter Brownback and Keith J. Allred had ruled two months earlier that only "illegal enemy combatants" could face military commissions, the Department of Defense waived the qualifier and said that all fourteen men could now face charges before Guantanamo military commissions. Bin Attash, Khalid Sheikh Mohammed, Ammar al Baluchi chose to serve as their own attorney. They requested laptops, and internet access, in order to prepare their defenses. In October 2008, Ralph Kohlmann ruled that they be provided with the computers, but not the internet access. On December 8, 2008, Khalid Sheikh Mohammed told the judge that he and the other four indictees wished to confess and plead guilty; however, the plea would be delayed until after mental competency hearings for Hawsawi and bin al-Shibh. Mohammed said, "We want everyone to plead together." On May 17, 2010, Saba News reported that Walid bin Attash, and four other Yemenis would face charges in the summer of 2010. Two of the other Yemenis Saba News reported would face charges were: Ramzi bin al-Shibh and Abd al-Rahim al-Nashiri. ^ Deputy Secretary of Defense Paul Wolfowitz (August 10, 2004). "Prepared Statement for the House Armed Services Committee: As Prepared for Delivery by Deputy Secretary of Defense Paul Wolfowitz, Washington, DC". Department of Defense. Retrieved April 15, 2007. ^ Robert S. Mueller, III (February 24, 2004). "Testimony of Robert S. Mueller, III, Director, FBI: Before the Select Committee on Intelligence of the United States Senate". Department of Defense. Retrieved April 15, 2007. ^ "National Commission on Terrorist Attacks upon the United States". 911 Commission. Retrieved April 15, 2007. ^ Glaberson, William (July 11, 2008). "Detainees, as Lawyers, Test Tribunal System". New York Times. Retrieved September 27, 2011. ^ "Detainee Biographies". Office of the Director of National Intelligence. Archived from the original (PDF) on 2009-08-31. ^ a b OARDEC (February 8, 2007). "Summary of Evidence for Combatant Status Review Tribunal - Bin Attash, Walid Muhammad Salih" (PDF). Department of Defense. Retrieved 2007-04-15. ^ a b c Bell, Stewart. "The Martyr's Oath", 2005. ^ Phil Hircshkorn (2006-03-28). "Al Qaeda witnesses saw Moussaoui as a bumbler". CNN. Archived from the original on 2009-05-08. Tawfiq bin Atash, a senior al Qaeda operative considered the mastermind of the USS Cole bombing in 2000, also assisted the 9/11 plot. ^ OARDEC (9 November 2004). "Summary of Evidence for Combatant Status Review Tribunal -- Bin Attash, Hassan Mohammed Ali (released September 2007)" (PDF). United States Department of Defense. pp. 64–65. Archived from the original (PDF) on 27 February 2008. Retrieved 2007-12-21. ^ B Raman (May 21, 2003). "Bomb jitters in Pakistan, too". Asia Times. Retrieved 2007-07-09. ^ Meyer, Josh (March 20, 2007). "Detainee confesses in Cole bombing". Los Angeles Times. Retrieved 2019-04-23. ^ OARDEC (2007-03-12). "Verbatim Transcript of Open Session Combatant Status Review Tribunal Hearing for ISN 10014" (PDF). United States Department of Defense. Retrieved 2010-04-13.